Total Internal Reflection Microscopy (TIRM) is a sensitive non-invasive technique to measure the interaction potentials between a colloidal particle and a wall with femtonewton resolution. The equilibrium distribution of the particle-wall separation distance z is sampled monitoring the intensity I scattered by the Brownian particle under evanescent illumination. Central to the data analysis is the knowledge of the relation between I and the corresponding z, which typically must be known a priori. This poses considerable constraints to the experimental conditions where TIRM can be applied (short penetration depth of the evanescent wave, transparent surfaces). 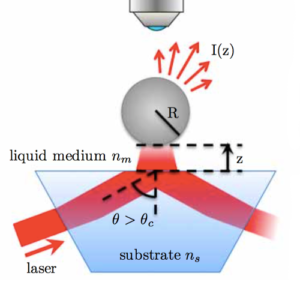 Here, we introduce a method to experimentally determine I(z) by relying only on the distance-dependent particle-wall hydrodynamic interactions. We demonstrate that this method largely extends the range of conditions accessible with TIRM, and even allows measurements on highly reflecting gold surfaces where multiple reflections lead to a complex I(z). Next Next post: Influence of Noise on Force Measurements published in Phys. Rev. Lett.